If you’re living with multiple chronic medical conditions, you’re not alone. A recent study found that more than 40% of Americans have at least one chronic health problem, such as diabetes, arthritis, heart disease, cognitive problems, mental health, or substance abuse problems. The Centers for Disease Control and Prevention (CDC) cite statistics from the Department of Health and Human Services that show 25% of Americans have multiple chronic health conditions, and that number rises to 75% for people age 65 and older. Managing multiple medical conditions can be complex, but there are steps you can take to ensure you get the care you need and lower your risk of experiencing a medical error related to the treatment of your conditions. According to the CDC, chronic diseases are the cause of 7 out of 10 deaths in the U.S. each year, as well as higher rates of disability. If you’re not managing your chronic medical conditions effectively, a number of problems that can affect your health and quality of life can arise. Researchers at the Georgetown University Health Policy Institute found that people with multiple chronic health problems spend an average of 5 days a year bed-ridden and only 59% of them are working, compared to 86% of people in the same age group who do not have a chronic condition. In addition, people with multiple chronic medical conditions are 5 times more likely to report fair to poor mental health compared to people with no chronic conditions. Connecting with the right specialists: For many people, their primary care physician handles the management of their chronic health problems. 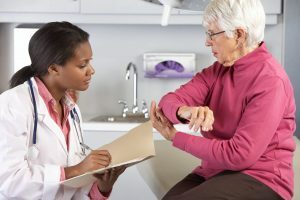 But a recent report from the Commonwealth Fund, a healthcare research foundation, found that one in four primary care physicians surveyed did not think their practices were well prepared to manage the care of patients with multiple chronic medical conditions. One solution is to work with specialists experienced in treating the conditions you face. For older patients, a geriatrician may be another good option to coordinate care for several chronic conditions. Coordinating care and medical records among all your physicians: If you’re receiving care from several specialists and a primary care physician, having a universal medical record can lower your risk of medical errors, such as duplicate prescriptions or medications that can cause serious interactions and missed follow-up on test results. A comprehensive, electronic medical record allows all the physicians who treat you to access your complete medical record. Understanding your conditions and treatment options: Ask your physicians to explain the symptoms, possible progression, and treatment options for your chronic medical conditions. Find out what side effects any medications or treatments may cause and how they may affect your quality of life. In addition to medical treatments, ask about lifestyle changes that may help you manage your conditions, such as exercise or physical therapy, diet, and stress management. Having support and objective information to guide the management of your chronic conditions: Managing multiple health problems can be easier when you have someone to help you keep on track with your care plan. Some insurance plans offer the services of a care or case manager who provides phone consultations and is available to answer questions about your conditions and treatments. A personal health advisor can be another good resource. An advisor can provide the latest information on treatment options, connect you with experienced specialists, and even attend appointments with you to take notes and ask questions. Taking steps to lower your risk of developing additional chronic conditions: You can lower your risk of developing many chronic health problems, like heart disease, diabetes, and high blood pressure, by making changes to your lifestyle. Eating a healthy diet and getting regular moderate exercise are two key ways to reduce your risk. These changes can also have a positive impact on your other health problems.